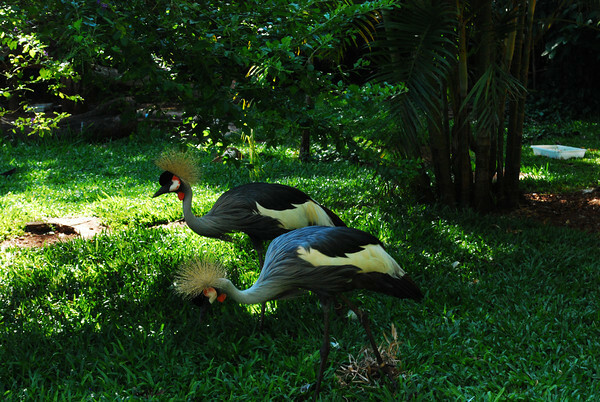 Grey crowned cranes that I photographed in a bird park in Brazil last year. Cranes and herons are among my favorite birds. In my mind, it is impossible for these long-lived, long-necked, long-legged, and long-winged creatures to do anything less than gracefully. Yet, while many herons are abundant in the wild and easily seen next to a pond or a lake in many parts of North America, cranes remain elusive for most urban dwellers. I’ve seen them only once in the wild: Sandhill cranes coming to a nightly roost on a bog in Georgia’s Okefenokee swamp. It was a sight bound to fill one with awe and admiration for these effortless flying apparitions. It is no surprise that the lore of so many cultures abounds with references to cranes – in some of these stories, cranes arrive at our deathbeds to take our souls to heaven. 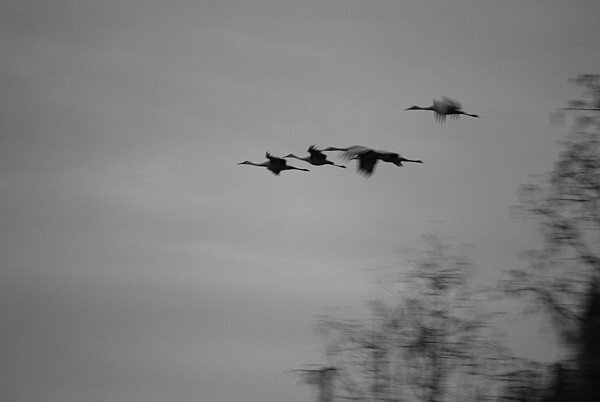 Cranes learned long ago of the need for social living in an indifferent or hostile world, of the value of prolonged and intense parental care, and of concern for the safety of the flock in the face of danger. They have seen mountain ranges rise and crumble, have watched entire civilizations rise and fall, and have observed great climatic changes that sometimes brought other animal groups to extinction. Yet, each year they dance with an exuberance that gives joy to anyone with the eyes to see it, or even the imagination to visualize it. They seasonally cross entire continents with a precision that makes our best instruments seem inadequate, and fly with a breathtaking beauty that must make every pilot more than a little envious. I have indeed often wondered if the angels that were “heard on high” above Bethlehem were not really migrating Eurasian Cranes – at least that’s a pleasant thought to contemplate.